“Treasury Designates Individual, Entity Posing Threat to Stability in Iraq,” U.S. Department of the Treasury, July 2, 2009, http://www.treasury.gov/press-center/press-releases/Pages/tg195.aspx. Ibrahimi is believed to be the most influential commander of the Haashid Shaabi, the umbrella group of anti-ISIS Shiite militias also called Iraq’s popular mobilization forces (PMF), and has played a key role in smuggling weapons from Iran to these militias in Iraq.“Top Iraqi Militia Leader: Fighting for Iran under Soleimani's leadership Is “Blessing from God”,” Middle East Institute, April 5, 2017, http://www.mei.edu/publications/top-iraqi-militia-leader-fighting-iran-under-soleimanis-leadership-blessing-god. In addition to acting as the leader of KH, Ibrahimi serves as Iraq’s deputy national security advisor and the deputy commander of the Haashid Shaabi.Liz Sly, “Pro-Iran militias’ success in Iraq could undermine U.S.,” Washington Post, February 15, 2015, http://www.washingtonpost.com/world/middle_east/iraqs-pro-iranian-shiite-militias-lead-the-war-against-the-islamic-state/2015/02/15/5bbb1cf0-ac94-11e4-8876-460b1144cbc1_story.html; Phillip Smyth, “There Is No ‘Good’ Shia Militia in Iraq,” Daily Beast, April 17, 2015, http://www.thedailybeast.com/articles/2015/04/17/is-there-a-good-shia-militia-in-iraq.html. He is also a former member of Iraqi parliament.Babak Dehghanpisheh, “Special Report: The fighters of Iraq who answer to Iran,” Reuters, November 12, 2014, http://www.reuters.com/article/2014/11/12/us-mideast-crisis-militias-specialreport-idUSKCN0IW0ZA20141112. Richard R. Brennan et al., eds., Ending the U.S. War in Iraq: the Final Transition, Operational Maneuver, and Disestablishment of United States Forces-Iraq (Santa Monica: RAND Corporation, 2013), 138-139, http://www.rand.org/content/dam/rand/pubs/research_reports/RR200/RR232/RAND_RR232.pdf. According to Iraqi Major-General Jumaa Enad, Ibrahimi today is “realistically and operationally” the leader of the PMF.Nour Malas, “The Militia Commander Beating Back ISIS in Iraq Makes the U.S. Nervous,” Wall Street Journal, June 2, 2016, http://www.wsj.com/articles/the-militia-commander-beating-back-isis-in-iraq-makes-the-u-s-nervous-1464890675. 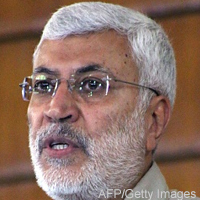 Muen al-Kadimi, deputy leader of another Shiite militia in Iraq, the Badr Organization, confirmed that Ibrahimi is one of the highest-level commander in the PMF, saying that Ibrahimi “signs off on things.”Nour Malas, “The Militia Commander Beating Back ISIS in Iraq Makes the U.S. Nervous,” Wall Street Journal, June 2, 2016, http://www.wsj.com/articles/the-militia-commander-beating-back-isis-in-iraq-makes-the-u-s-nervous-1464890675. Nour Malas, “The Militia Commander Beating Back ISIS in Iraq Makes the U.S. Nervous,” Wall Street Journal, June 2, 2016, http://www.wsj.com/articles/the-militia-commander-beating-back-isis-in-iraq-makes-the-u-s-nervous-1464890675. According to U.S. diplomat Ali Khedery speaking on behalf of Sunni, Shiite, and Kurdish officials, “the real prime minster of [Iraq] is [Iranian commander] Qasem Soleimani and his deputy is Abu Mahdi al-Muhandis [Ibrahimi].”Michael Weiss and Michael Pregent, “The U.S. Is Providing Air Cover for Ethnic Cleansing in Iraq,” Foreign Policy, March 28, 2015, http://foreignpolicy.com/2015/03/28/the-united-states-is-providing-air-cover-for-ethnic-cleansing-in-iraq-shiite-militias-isis/. Ibrahimi was born in Basra, in southern Iraq. For years, he worked alongside Iran’s Islamic Revolutionary Guard Corps (IRGC) and the Badr Organization (previously called the Badr Corps). After the 2003 U.S. invasion of Iraq, Ibrahimi helped smuggle in a certain kind of improvised explosive device (IED) known as explosively formed penetrators (EFPs) from Iran into Iraq. EFPs were the primary killer of U.S. troops in Iraq from 2003 to 2011.Nour Malas, “The Militia Commander Beating Back ISIS in Iraq Makes the U.S. Nervous,” Wall Street Journal, June 2, 2016, http://www.wsj.com/articles/the-militia-commander-beating-back-isis-in-iraq-makes-the-u-s-nervous-1464890675. Abu Mahdi al-Basari“Treasury Designates Individual, Entity Posing Threat to Stability in Iraq,” U.S. Department of the Treasury, July 2, 2009, http://www.treasury.gov/press-center/press-releases/Pages/tg195.aspxl. Abu Mahdi al Baseri“Treasury Designates Individual, Entity Posing Threat to Stability in Iraq,” U.S. Department of the Treasury, July 2, 2009, http://www.treasury.gov/press-center/press-releases/Pages/tg195.aspxl. Abu Mahdi al-Basri al-Muhandis“Treasury Designates Individual, Entity Posing Threat to Stability in Iraq,” U.S. Department of the Treasury, July 2, 2009, http://www.treasury.gov/press-center/press-releases/Pages/tg195.aspxl. Abu Mahdi al-Madan“Treasury Designates Individual, Entity Posing Threat to Stability in Iraq,” U.S. Department of the Treasury, July 2, 2009, http://www.treasury.gov/press-center/press-releases/Pages/tg195.aspxl. Abu-Mahdi al-Mohandis al-Basri“Treasury Designates Individual, Entity Posing Threat to Stability in Iraq,” U.S. Department of the Treasury, July 2, 2009, http://www.treasury.gov/press-center/press-releases/Pages/tg195.aspxl. Abu-Mahdi al-Mohandas“Treasury Designates Individual, Entity Posing Threat to Stability in Iraq,” U.S. Department of the Treasury, July 2, 2009, http://www.treasury.gov/press-center/press-releases/Pages/tg195.aspxl. Abu Mahdi al-Muhandes“Treasury Designates Individual, Entity Posing Threat to Stability in Iraq,” U.S. Department of the Treasury, July 2, 2009, http://www.treasury.gov/press-center/press-releases/Pages/tg195.aspxl. Abu Mehdi al-Mohandess“Treasury Designates Individual, Entity Posing Threat to Stability in Iraq,” U.S. Department of the Treasury, July 2, 2009, http://www.treasury.gov/press-center/press-releases/Pages/tg195.aspxl. Abu-Muhannad al-Muhandis“Treasury Designates Individual, Entity Posing Threat to Stability in Iraq,” U.S. Department of the Treasury, July 2, 2009, http://www.treasury.gov/press-center/press-releases/Pages/tg195.aspxl. Jaafar Jamal Jaafar“Treasury Designates Individual, Entity Posing Threat to Stability in Iraq,” U.S. Department of the Treasury, July 2, 2009, http://www.treasury.gov/press-center/press-releases/Pages/tg195.aspxl. Jamal al-Ibrahimi“Treasury Designates Individual, Entity Posing Threat to Stability in Iraq,” U.S. Department of the Treasury, July 2, 2009, http://www.treasury.gov/press-center/press-releases/Pages/tg195.aspxl. Jamal al-Madan al-Tamimi“Treasury Designates Individual, Entity Posing Threat to Stability in Iraq,” U.S. Department of the Treasury, July 2, 2009, http://www.treasury.gov/press-center/press-releases/Pages/tg195.aspxl. Jamal Fa’far ‘Ali al-Ibrahimi“Treasury Designates Individual, Entity Posing Threat to Stability in Iraq,” U.S. Department of the Treasury, July 2, 2009, http://www.treasury.gov/press-center/press-releases/Pages/tg195.aspxl. Jamal Ja’afar Ibrahim al-Mikna Bihaj“Treasury Designates Individual, Entity Posing Threat to Stability in Iraq,” U.S. Department of the Treasury, July 2, 2009, http://www.treasury.gov/press-center/press-releases/Pages/tg195.aspxl. Jamal Jaafar Mohammed“Treasury Designates Individual, Entity Posing Threat to Stability in Iraq,” U.S. Department of the Treasury, July 2, 2009, http://www.treasury.gov/press-center/press-releases/Pages/tg195.aspxl. Jamal Ja’afar Muhammad Ali al-Ibrahimi“Treasury Designates Individual, Entity Posing Threat to Stability in Iraq,” U.S. Department of the Treasury, July 2, 2009, http://www.treasury.gov/press-center/press-releases/Pages/tg195.aspxl. Jamal Jafaar Mohammed Ali Ebrahimi“Treasury Designates Individual, Entity Posing Threat to Stability in Iraq,” U.S. Department of the Treasury, July 2, 2009, http://www.treasury.gov/press-center/press-releases/Pages/tg195.aspxl. Jamal Ja’far al-Ibrahimi“Treasury Designates Individual, Entity Posing Threat to Stability in Iraq,” U.S. Department of the Treasury, July 2, 2009, http://www.treasury.gov/press-center/press-releases/Pages/tg195.aspxl. Jamal Ibrahimi“Treasury Designates Individual, Entity Posing Threat to Stability in Iraq,” U.S. Department of the Treasury, July 2, 2009, http://www.treasury.gov/press-center/press-releases/Pages/tg195.aspxl. Jamil Jafar al-Ibrahimi“Treasury Designates Individual, Entity Posing Threat to Stability in Iraq,” U.S. Department of the Treasury, July 2, 2009, http://www.treasury.gov/press-center/press-releases/Pages/tg195.aspxl. “The Engineer”Babak Dehghanpisheh, “Special Report: The fighters of Iraq who answer to Iran,” Reuters, November 12, 2014, http://www.reuters.com/article/2014/11/12/us-mideast-crisis-militias-specialreport-idUSKCN0IW0ZA20141112. The U.S. Department of the Treasury designated “Abu Mahdi al-Muhandis” as a Specially Designated Global Terrorist (SDGT) on July 2, 2009.“Treasury Designates Individual, Entity Posing Threat to Stability in Iraq,” U.S. Department of the Treasury, July 2, 2009, http://www.treasury.gov/press-center/press-releases/Pages/tg195.aspx. The United Arab Emirates designated “Hizbollah Brigades in Iraq” as a terrorist organization in November 2014.“List of groups designated terrorist organisations by the UAE,” National (Abu Dhabi), November 16, 2014, http://www.thenational.ae/uae/government/list-of-groups-designated-terrorist-organisations-by-the-uae. “I am the soldier of Hajj Qassim [Qasem Soleimani], this is a divine blessing.”“قائد الحشد الشعبي: أفخر بكوني جندياً لدى سليماني,” elBashayer Online, April 4, 2017, http://elbashayeronline.com/news-802609.html; “Top Iraqi Militia Leader: Fighting for Iran under Soleimani's leadership Is “Blessing from God”,” Middle East Institute, April 5, 2017, http://www.mei.edu/publications/top-iraqi-militia-leader-fighting-iran-under-soleimanis-leadership-blessing-god. “To the Americans we say … we will not be quiet about this attack.”Mina Aldroubi, “Iraqi militias warn US over air strike on Syrian border,” National (UAE), June 25, 2018, https://www.thenational.ae/world/mena/iraqi-militias-warn-us-over-air-strike-on-syrian-border-1.744071.